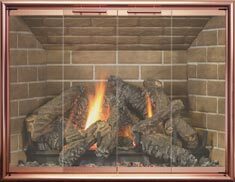 Beauty: Stoll offers fireplace glass doors in a broad selection of styles and finishes to accent your fireplace and fit your decor. Designs range from simple to ornate; antique to modern. Select from a palette of colors and metal finishes in endless combinations. Optional Stoll decorative design elements add interest and dimension to personalize your door. Or, have our artisans incorporate a unique design of your own creation. 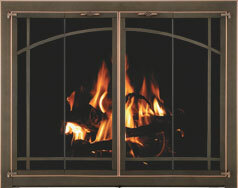 Glass doors are framed with 1” x 3/16” steel that can be finished to match or contrast the main frame. 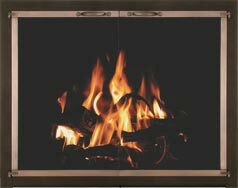 Doors are available in Cabinet or Bifold style; fully framed or with the center left clear. Traditional Filigree: Adds decorative filigree overlay to top and/or bottom of the Traditional door. The heavyweight champion! The Original Iron frame is crafted of 10 gauge channel iron with a more robust 1” profile. Even the largest doors will remain true on this exceptionally rigid frame. 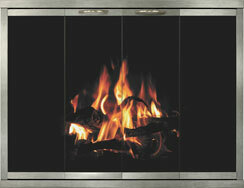 Frameless TotalView glass doors are an elegant option to our Traditional style. 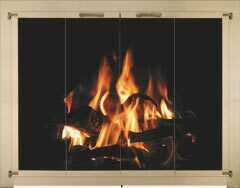 TotalView style doors are available in Cabinet or Bifold style and an option for any Stoll frame type. The Manhattan door is the perfect compliment to any clean and modern room. It is remarkably simple with hidden hardware and hinges. 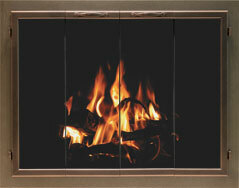 Custom made to fit any fireplace and available in an of our finishes. The Columbia door in the Bar Iron Collection is a standard size Bar Iron Door. This means you get the strength and texture of a Bar Iron door with 2-3 week lead time. Get the same customization features as a custom door. 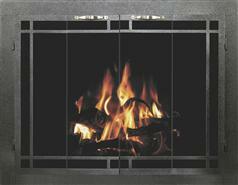 The Rectangle door in the Bar Iron Collection is the ultimate custom fireplace door. The sky is the limit in our customization capabilities; if you have a vision, we can build it. The door frames are recessed into the bar iron main frame using European style hinges to create a flush custom cabinet appearance. 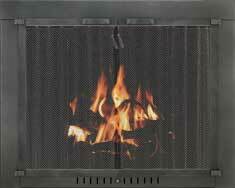 This provides a very clean and seamless feel to the overall atmosphere of the fireplace. Main frames and/or door frames can be electroplated in the finish of your choice. 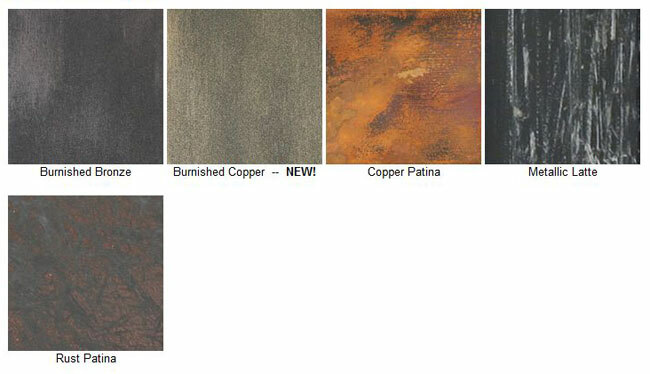 The result is a seamless finish in brass, copper, or nickel with the low maintenance qualities and strength of steel. Plated finishes are rock solid, and exude class unparralelled by any other finish. 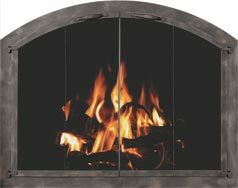 Arched fireplaces vary greatly in shape and design. 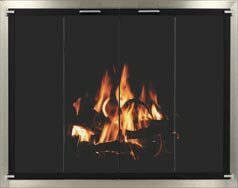 Stoll accurately replicates the shape of the fireplace using a templating process and CAD controlled laser cutting to ensure a precise fit. 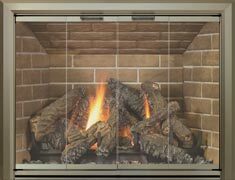 Stoll's lintels/mortar frames are an excellent way to help build or refinish a fireplace with an arch opening. 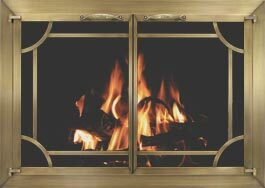 The unique feature of this fireplace door is that it creates the illusion of an arched fireplace in your rectangular fireplace opening. 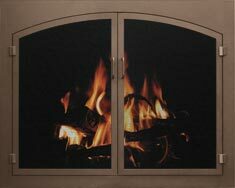 Installing this custom fireplace door can give your whole fireplace a new, improved appearance. Glass-backed sidelights and transoms add additional detail and interest. 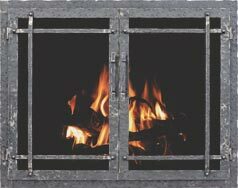 They also work very well with large fireplace openings where the doors are reduced in size for ease of handling. Custom designs and text can be laser-cut into the main frame for the ultimate in personalization. 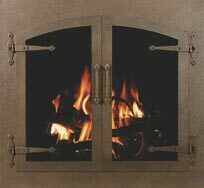 This new creation from Stoll is a wonderful addition to a period home or rustic hearth. The design uses hammer distressed metal work and riveted corner brackets to replicate the look of metalwork crafted at the forge and anvil. The aged iron effect is created with a two-step hand finishing process. The result is a beautiful patina that replicates the appearance of age and wear associated with years and years of use. 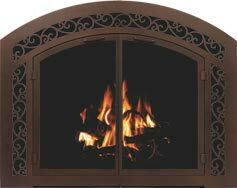 The Stoll Blacksmith style adds detail and ornamentation to your fireplace. Individual elements can be removed to suit your taste. 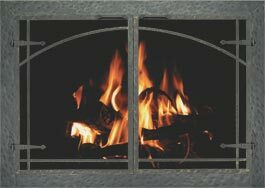 The frame is specially designed to convert rectangular openings to the look of an arched fireplace in one step. The Legacy Collection of glass doors is a brand new line that showcases Stoll innovation and design. 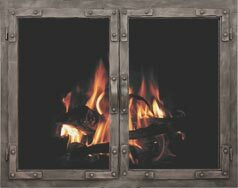 Extruded Aluminum fireplace doors have been around for ages, however, nobody else has the unique designs and industry leading features like Stoll. The Huntington slim and sleek rectangular frame is well suited for smooth facias such as marble, tile & granite, creating the perfect minimalist accent. 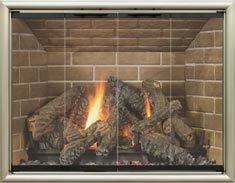 The beveled frame of the Lancaster offers classic styling with an updated flair; making a bold statement that will highlight your fireplace perfectly. 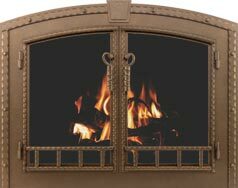 The deep double radius frame of the Coronado creates a unique 3D appearance that brings life to each and every fireplace setting it graces. The Stockton smooth radius frame establishes an understated elegance; simple design details create a quiet and subtle accent for any decor. 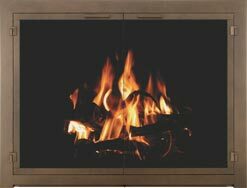 Stoll stainless steel enclosures are the ultimate outdoor fireplace furnishing. Solid 3/16” type 304 stainless steel frames, stainless steel screens, and stainless steel mounting hardware provide superior weather resistance. 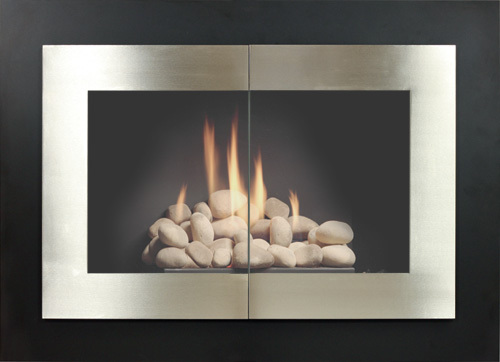 A Stainless Steel ReFace is an excellent choice for a manufactured firebox. 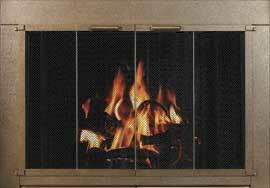 Hanging Mesh is available for glass fireplace doors. 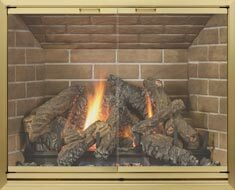 Classic molded contours and mitered corners create the perfect frame for your fireplace. The main frame and door frames are constructed of thick aluminum extrusions made to Stoll’s specifications which creates exceptional strength, durability, and weather resistance. This door is constructed of 3/16" bar aluminum, similar in dimensions to our Stainless Steel or Bar Iron doors. The door frames are constructed of extruded aluminum similar to the door frames of the Premier Extruded doors. The Kingston is a custom fireplace door with a slim 1" frame width, hidden hinges and Kingston handles. 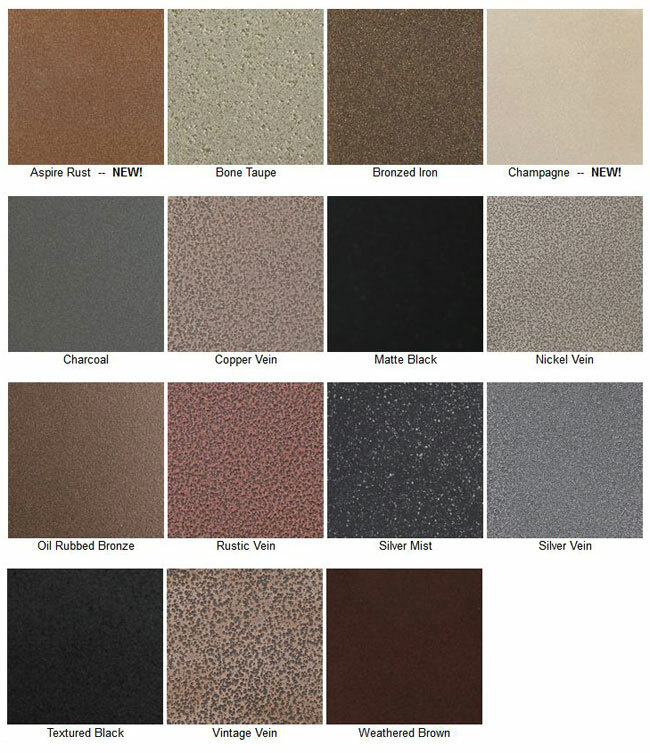 Choose from four power coat and four overlay finishes. Hanging Mesh w/ Curtain Rod is optional. powder coat finishes. Clear Glass & Slotted Damper are standard, Hanging Mesh is optional. Featuring a slimmer 5/8” frame profile, Trenton doors are available in 9 standard sizes. Choose from six power coat finishes. Hidden damper is standard. Hanging mesh & Filigree are optional. 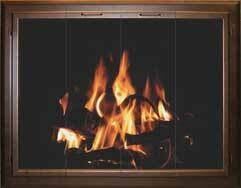 Homeowners who live in warmer climates often opt for a screen for spark protection rather than glass doors. 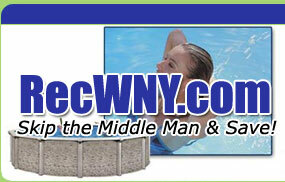 Stoll offers three mesh options, Hanging Mesh Kit, Standard Mesh & Traditional Mesh. Childhood memories of sitting around grandma’s fireplace come back to life with the classic look of hanging mesh. 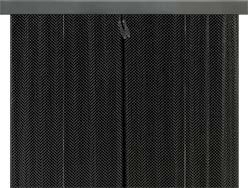 Restore your fireplace with our new Hanging Mesh Kit which comes complete with header bar, curtain rod and 19 gauge hanging mesh with wire pulls.